Title: "Hellhound of the battlefield", "Wonderwall", "The Dreaded Slayer of Chew Toys"
Don't let that cute face fool you. Wonderwall in a biological weapon wrapped up in a neat dog shaped package. Temperamental, vulgar, selfish, overconfident, and vengeful are just a few words to describe this highly emotional creature. This ex-police dog doesn't play very well with others and isn't afraid of getting his paws dirty. Wonderwall is a die hard fighter with nerves of steel. He will often dive head first into a fight without fathoming the consequences. Even if he is outnumbered, he feels as if he can take on anyone, and anything. This dog has a real god complex. With that being said, Wonderwall hates to lose. He will resort to dirty tactics if he is put in a situation that was no longer in his favor. Unfortunately, for those who hang around this pooch, he likes to talk a lot. He can be quite boisterous at times. This can be very annoying to others as Wonderwall has little to no filter whatsoever. He'll tell you what's on his mind and doesn't really care if it hurts your feelings. On the outside, Wonderwall may seem like a mean mongrel but, deep down under that layer of alpha male toughness and tasteless insults, is a lonely dog with no structure in life. At the end of the day, he is still a dog. Somewhere inside of him is a loyal pooch just wanting to get out. If he sees you as a companion you might just catch a little glimpse of a more reasonable side of him. Wonderwall started his humble beginnings on the right side of the law as a police dog in Manhattan, New York. Diego was born on a cool crisp autumn morning at the Iron-Hide dog facility in upstate New York.This exclusive and secluded dog kennel specialized in highly intelligent meta-canines. He was born to a small litter of three, which is not uncommon among meta dogs. At four weeks old Diego’s powers made themselves known, to the delight of his caretakers. He created a weak force field around him and his mother whilst nursing from her. This force field lasted for three minutes and thirty two seconds. Diego started his obedience training at 10 weeks old. His was a starry eyed little pup with loads of potential. His willingness to learn and force field ability made him a prime candidate for future employment. At eleven months Diego was pick up by Manhattan police. Having a meta within their ranks would prove useful to help fight both vigilantes and villains alike. Diego was immediately put through police training at the age of two. This is when he met his handler, and future best friend, Preston Moore. A scientist implanted a chip into Wonderwall's brain that would allow him to speak. +This merely allows Wonderwall the ability to broadcast his voice over TVs, radios, phones, and intercoms. Really, anything that can receive a signal and has a speaker. This signal doesn't go very far, however. Wonderwall has to be at least five feet from his desired speaker in order to talk, the closer he is the clearer his voice will be. Wonderwall can only speak English. He has a very gruff tone, sounding as if he were a tired middle aged man trapped in a dog's body. This ability allows Wonderwall to erect a shield using his mind. + The shield is only big enough to cover Wonderwall and a couple of other people in a light blue bubble made up of supercharged atoms. The diameter of this bubble is seven feet. The bubble is able to deflect bullets, missiles, bombs, and elemental attacks. Wonderwall wouldn't be called a hellhound if he didn't have the power to summon a hellish flame. This power is fueled by sheer emotion, the hotter his temper the larger and more intense the inferno. +The flame can appear anywhere on his body and even engulf him completely in a fiery inferno. This fire can get very VERY hot. In some instances he is able to melt metal. +Much like a dragon, Wall can also breath fire. He is a bit tougher than the average canine. + Wonderwall has a secondary layer of defense just under his soft fur coat. His skin is tough, like leather. He can take a quite a beating. This skin will not protect him from Metahuman powers or other supernatural attacks. It serves as a second layer of protection from knives, punches, kicks, and baseball bats. +Wonderwall's jaws strength is stronger than that of a normal canine. His jaw pressure is comparable to that of a crocodiles'. He is able to break a mortal's bones with a well placed bite. - You can easily shut him up by destroying whatever he is using to talk through. Due to some unfortunate circumstances in the lab, Wonderwall is no longer able to keep the bubble up for as long as he used to, is he able to move while it is erected. -He is only able to hold the bubble together for as long as he can hold his breath, which is two minutes tops and much less than that if he is out of breath. The cool down time for the bubble is from thirty seconds to a minute, maybe even longer if he is stressed. - It is possible to dig under the force-field as the ground inside of the bubble is not protected whatsoever. - Wonderwall has to remain stationary while he uses it. If he moves even one paw from the ground the bubble with shatter. Attacks that either keep him moving or move the ground under his paws will keep him from using it. - He cannot use this power while he is being touched. If he is touched by those inside of the bubble it will shatter. - Water. The more intense the flame the more water it will take. It's much harder for Wonderwall to use his powers in the rain. Usually, in a downpour he is left with nothing but a smoldering maw. - Earth. It is possible to snuff out his flame by dumping soil, dirt, and even mud on him. - Trapping him in a vacuum of any kind will also work against this fire ability. If he is unable to breath then his fire power doesn't stand a chance. - His armor has a weak point. It, oddly enough, is located on Wonderwall's belly. This area can be easily penetrated by a knife. You can think of this as his weak point. One swift kick to this area will incapacitate him. - He isn't bulletproof. While his flesh can soften the blow of other weapons, bullets will still do the same amount of damage to him as any ordinary dog. - He can still feel pain. - You can easily keep his mouth closed with tape, a muzzle, belts, or even a semi-strong grip. All of his strength goes into closing his mouth, not opening it. -Wall isn't as focused as he used to be back in the days of war. His power has gone to his head. Nowadays, he can be very arrogant and very VERY stupid when he gets angry. It is possible to use his anger to your advantage, as he is a bit crazy when really pissed off. Despite one of his powers relying on his emotions, it can also be used against him. Wall's attacks aren't as accurate when he has worked himself into a tizzy and going all out. -Wall is only able to use one power at a time. He cannot talk while he is in the bubble. He also cannot erect a shield while he is breathing fire. Wonderwall carries a walkie-talkie around with him. This dark green walkie is covered in bite marks, scuffs, and dents. Wonderwall doesn't have any minions or followers at this time. -Wonderwall wants to get stronger. He wishes to return his powers to their former glory as well as obtain new ones. 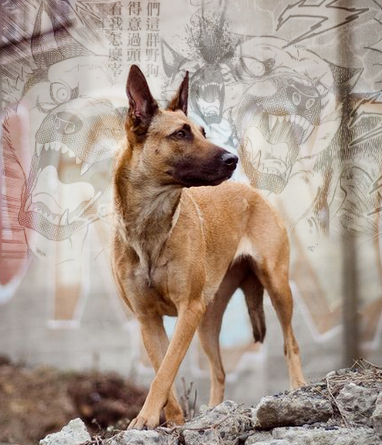 --This pooch wouldn't mind joining an evil crew. Despite his outward displeasure for company, deep down, in his cold little heart, he wants to join a pack. However, at the end if the day, Wonderwall does what Wonderwall wants. He just might stab you in the back for a bag of potato chips. He isn't neutral evil for nothing, you know. So long as you got what he wants he'll be your dog. Although, you might have to train him to heel. -He wants to dig his fangs into the hero(s) who killed his partner. He's gonna make them pay. -Wonderwall sees himself as more of a human than a dog and doesn't take kindly to being pet or whistled at. His personal space is also very important to him and he despises being touched. -Wonderwall has titanium fangs. He is able to use his fire power to heat up his fangs so that he can deliver a burning bite. This is his attack of choice, usually. -Sometimes his words are replaced with angry barks when he is cursing someone out. -He likes the taste of beer. -You call him Diego, he'll call you a f*ck head. -It's quite common to see smoke trickle from Wonderwall's nose, mouth, and ears when he's irritated or angry. -Wonderwall is house broken, but piss him off and he just might leave a steamy surprise in your slippers. -He likes to go for runs to clear his mind. -He enjoys sticking his head out of the window when riding in a car. -Wonderwall is an intact male. However, experiments and physical traumas left him sterile and unable to sire puppies. -Wall' loves raw hot dogs and pupperoni dog treats, although he'll deny liking the latter. -The word "bath" is a fightin' word. -Wonderwall likes to visit his old partner's grave from time to time. Preston Moore was the only person he had ever been able to bond with. Even in death, Wonderwall is still loyal to him.